$2,400.00 Badge of a Serviceman of the Volynsky Regiment (Volynets), 1917. This badge was awarded to one of the servicemen of the regiment's training battalion in St. Petersburg whose mutiny on 27 February 1917 started the chain of events leading to the abdication of Nicholas II and eventually, to the Bolshevik revolution later that year. Although issued during the brief Provisional Government period, this piece should be rightfully considered the first award of the new Soviet era - and a cornerstone of the advanced collection of early Soviet decorations. In very fine to excellent condition, the best specimen we have seen in years. $1,200.00 Badge to a Hero of the Revolutionary Movement of 1917-1918, two-layered version in brass, 1932. In fine to very fine condition, better than the average. $240.00 Photo ID of a Former Red Partisan, circa early 1930s. Issued to a former Red Partisan from Odessa region. In excellent condition, very uncommon for this type of document. 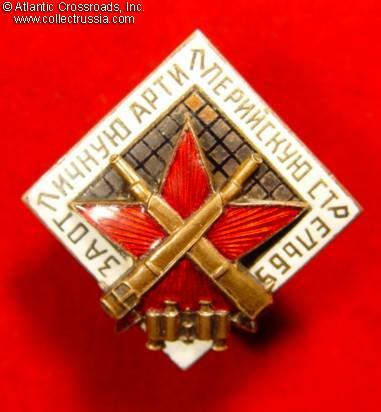 $850.00 Badge to an Honest Warrior of the Karelian Front, 1922. Scarce decoration of the Russian Civil War period, essentially the first Soviet campaign medal. The star is a replacement, but the badge is in otherwise excellent condition. Its overall state of preservation is outstanding for this early award. $3,750.00 Excellent Tank Driver badge, #962, late 1930s. In very fine to excellent condition, literally the best example we have handled to date. Exceptionally rare piece, especially free of repairs and with original screw plate included. This piece can be a fabulous focal point even for the most advanced collection of early Soviet badges and medals. $1,100.00 Badge for Excellent Shooting, 1928 - mid-1930s. An extremely scarce, 53 x 41 mm version of the larger, two-piece version of the badge. Issued by the Vystrel advanced training school for Red Army officers and snipers. In excellent condition. $350.00 Jetton for Winning the Second Place in Sharpshooting Competition, in hallmarked silver, 1928 issue. Inscribed on the reverse to a member or employee of the Ukrainian Government (Central Executive Committee of Ukraine.) A very attractive and uncommon early piece! $390.00 Badge for Excellent Artillery Readiness, #12472, 1936-1941. A very uncommon piece in excellent condition. Includes original maker marked screw plate. $350.00 Excellence in the Navy badge, Type 1 in silver, #2826, circa 1939. Mint marked "MD" to the reverse. Nice early WW2 naval award in very fine condition. $140.00 Excellent RKKA Serviceman, unnumbered, circa 1941-42. A superb example manufactured by the Moscow Mint just before the Patriotic War and issued during the first year of the war. Comes with original mint marked screw plate. $1,300.00 Military Navigators School, graduation badge, 1938-1941. Extremely attractive badge in very fine overall condition.